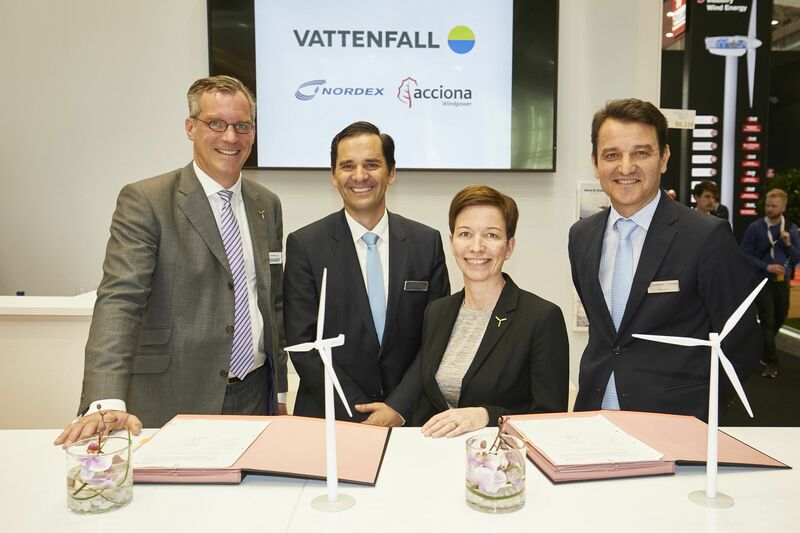 Hamburg (renewablepress) - Today, Vattenfall, the owner of the Dutch electricity company Nuon, signed a delivery contract for the expansion of the “Wieringermeer” wind farm with the Nordex Group at the Global Wind Summit in Hamburg. The expansion comprises 32 N117/3600 turbines. Last year Vattenfall had ordered 50 turbines from the same series, of which construction is currently prepared. The expansion contract entails the delivery and installation of the turbines as well as service for at least two years. Vattenfall is a leading European energy company, which for more than 100 years has electrified industries, supplied energy to people’s homes and modernised our way of living through innovation and cooperation. We now want to make fossil-free living possible within one generation. That's why we are driving the transition to a sustainable energy system through initiatives in renewable production and climate smart energy solutions for our customers. We employ approximately 20,000 people and have operations mainly in Sweden, Germany, the Netherlands, Denmark, the UK and Finland. Vattenfall is owned by the Swedish state.